This scarf was made by dampening a gauze silk scarf and creating lengthwise 'pleats' until the scarf was about 12" wide. Dampening the scarf helps keep the pleats in place while they are formed. 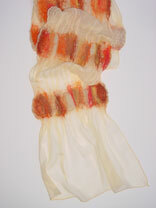 Then bands of roving, which hold the 'pleats' together, were formed on the scarf. Each band of roving was formed by first putting a base layer of roving crosswise on the scarf. Then different color rovings were layered across the base roving in the lengthwise direction. The bands of roving were felted with a sander and lightly fulled on a glass washboard. Finished size: ~ 8" x 54"